This iconic billowing-sail shaped hotel, standing on an artificial island on Jumeirah Beach, is the world’s most luxurious hotel. It has reception desks on every floor, discreet in-suite check-in, Jacuzzis in every suite, a Rolls Royce fleet and butler service round the clock. There are 6 signature restaurants offering the finest gastronomic delights, the Assawan Spa and Health Club, unlimited access to Wild Wadi Waterpark and an exclusive private beach. The hotel also has top class venues for meetings and events. The banqueting venues and exquisite ballrooms and boardrooms with spectacular views, are the perfect setting for high level meetings. They are equipped with state of the art technology and world class facilities to cater to any business requirement. The atrium of the hotel, around 600 feet high and rising from the lobby to the hotel’s upper floors, is the world’s tallest atrium and has pillars covered with 22-karat gold. Al Mahara restaurant offers an undersea dining experience with breath-taking view of a giant wall aquarium. A 3-minute submarine ride takes guests from the lobby to the restaurant. 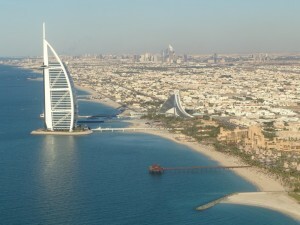 There is a helipad on top of the building used for bringing guests to and from the Dubai International Airport. The building is beautifully illuminated at night by choreographed lighting representing water and fire. 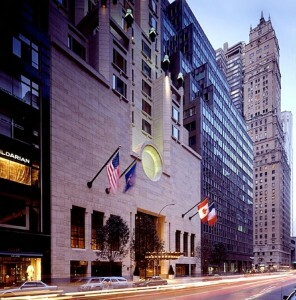 Located in Midtown Manhattan, towering 52 storeys tall over 57th street near Fifth Avenue, this sophisticated hotel is the ultimate word in five star comfort. The elegantly decorated rooms come with marble bathrooms, hand-crafted furniture and incredible views of the city. You can also avail of world class fitness and spa facilities, shop at Avakian boutique or admire art exhibits at the Arcadia gallery. The finest culinary delights can be enjoyed at the lovely Garden and you can relax with snacks and drinks at the Bar or the lounges. The Business Centre offers free Wi-Fi, audio-visual equipment, translation and secretarial services and multilingual concierge services. 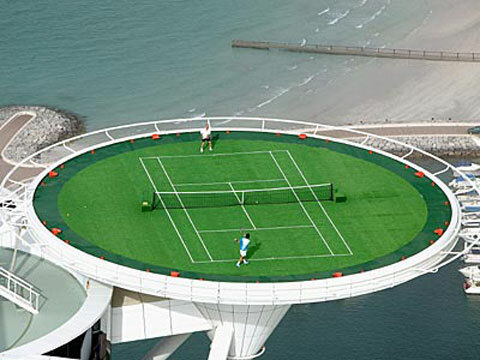 It also has 9,580 sq. ft. of event space. There are nine function rooms equipped with the latest technological tools needed for a successful conference. The deep soaking tubs in the rooms take just 60 seconds to fill up! The hotel has a complimentary video and board-game library for families. Child friendly services include baby-sitting services, complimentary toys, books and baby equipment. The Garden is a casual dining restaurant with tables between huge African Acacia trees. Prominent in the Hong Kong skyline, the Ritz Carlton is located in the International Commerce Centre in West Kowloon, Hong Kong. Covering floors 102 to 118, it is an oasis of refined elegance and luxurious comfort. 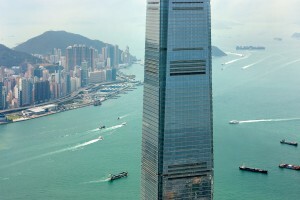 The rooms have magnificent views of the Victoria Harbour and the city. The luxurious suites have 24-hour access to the Club lounge, which offers six complimentary food and beverage presentations daily, as well as a dedicated Club Concierge, work stations, meeting rooms and Wi-Fi throughout. There are 6 dining venues serving world class cuisine, lounges, a spectacular rooftop bar and spa services. The hotel had 10 meeting facilities with a total space of 1300 sq. m. with latest equipment for corporate and social events. The Ritz Carlton, Hong Kong, is the highest hotel of the world. The Ritz Carlton Spa, the highest in the world, has dazzling views of the city and harbour. Ozone, the rooftop bar, is located on the 118th floor. The express elevator takes 50 seconds to reach the main lobby on the 103rd floor. The beautiful five star 56 storey business luxury hotel, located in the heart of Dubai and close to the Dubai Metro Station, is a meeting and events destination in its own right. The rooms have floor to ceiling windows, latest automation systems and free Wi-Fi. It has 15 restaurants and bars, an open sky swimming pool, a health club and spa, a private beach, Wild Wadi Waterpark complimentary access and the elite shopping destination – The Boulevard. The hotel has 12 boardroom-style congress rooms for hosting corporate events. There are also outdoor venues and a beautiful ballroom for hosting various events. The Boulevard is a shopping destination spread over an area of 13,050 sq. m. has two floors of high-end shopping and eateries. Vu’s bar offers you not only spectacular sea-views but also 200 cocktails to choose from. The in-room bath menu allows you to choose your preferred treatment and turns your bath into your private spa. 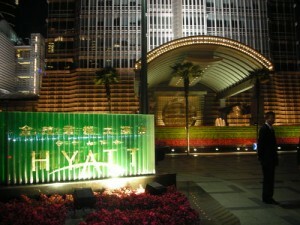 The opulent five star Grand Hyatt in Shanghai occupies floors 53 to 87 of the 88 storeyed Jin Mao Tower. The famous features of the hotel are its barrel-vaulted atrium, the Skywalk (a 1,520 sq. m. indoor observation deck with fantastic city views), the Club Oasis Spa, top class restaurants and the Cloud 9 Bar. The hotel has 19 event venues including the Grand Ballroom. Conference rooms have high-speed internet access and Wi-Fi (throughout the hotel), video-conferencing facilities and high level technical support. The 40 sq. m. Grand King room has a 24-hour concierge, marble bathroom, special work area and a grand floor-to-ceiling window view. The Skywalk can hold over a 1000 people. The Business Centre offers state of the art services, including secretarial support, translation service, facsimile transmission and office equipment rental. The Grand Café is open 24 hours and offers both western and local menus. 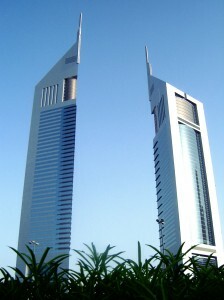 Marvels of engineering and architectural skills, the high-rise hotels across the world are iconic landmarks. Cocoons of luxury, they offer the best of food, drinks and facilities, and above all impeccable service. All this in a setting high above the streets, overlooking views which makes a guest feel truly like the monarch of all he surveys. 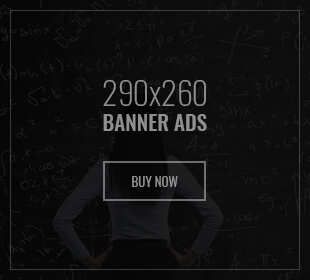 to find things to enhance my web site!I guess its ok to use a few of your ideas! Heya i’m for the first time here. I found this board and I in finding It really helpful & it helped me out a lot. I hope to offer something again and aid others such as you helped me.